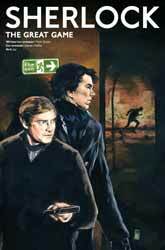 This issue continues the story’s discussion about Sherlock’s emotional detachment, which John finds hard to stomach. However, as Sherlock argues (spelling out a point already alluded to in #2, caring won’t actually help to save any of the people who are in danger. When the bomber sends the detective a clue to his next puzzle, John is still seething and initially refuses to help – which actually makes his empathy counterproductive. The clinching line from Sherlock, “Not much cop, this caring lark,” gets his friend back on board. Ironically, following previous statements about the detective’s uncluttered mind, from which he has deleted all knowledge of astronomy in order to save ‘disk space’, Sherlock’s latest case involves the death of an amateur stargazer and leads him to a planetarium. Towards the end of this issue, Sherlock pauses to look up at the stars… and no, this isn’t a lead-in to the old joke about Holmes and Watson going camping! John is surprised. “I thought you didn’t care about things like that,” he says. “Doesn’t mean I can’t appreciate it,” Sherlock replies. There are some awkward silent moments when Sherlock, John and Lestrade examine a body on the South Bank of the River Thames, and it’s not always entirely clear to whom the speech balloons are pointing. However, there’s plenty here to entertain Sherlockians – including the introduction of the modern equivalent of the Baker Street Irregulars.